Among our normal product updates, Referral Rock has put a large focus on updating and expanding our integration capabilities and documentation. At last, we have achieved a public launch on the automation service, Zapier! This means that you are now able to connect your Referral Rock account to any number of Zapier’s supported apps. Zapier allows you to set up what they call ‘Zaps’, or connections between two separate apps setting a triggering action within one app that notifies a separate app to process the following action. Referral Rock is now a fully supported app within Zapier and can be set as a trigger or an action object. Meaning, when set as a trigger, a specified change within Referral Rock (i.e., adding a Member, approving a Referral) will cause a subsequent action (i.e., adding to a mailing list, closing a sale) within another app. As an action, you would specify another app as a trigger to cause a specific action to then occur within your Referral Rock account, just think the reverse of the aforementioned examples. For our documentation on using Zapier and Referral Rock, you can read more in our Knowledge Base here or check out our Zapbook on the Zapier page. As our integrations have increased, the layout of our integration information within our admin UI slowly became less functional so we have given it a facelift! 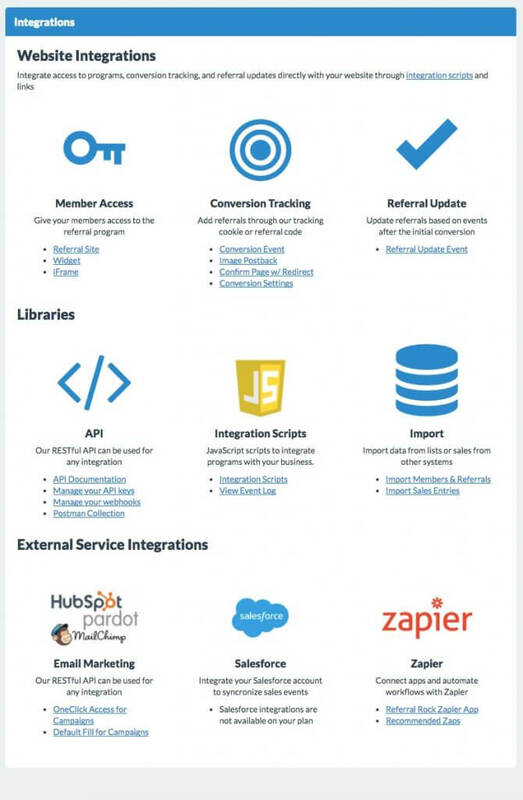 Head over to the brand new Integrations tab within your Referral Rock account to check out the (hopefully) more clear layout as well as a few additions to our integrations offerings. See our last product update and read more about the products Referral Rock now integrates with on Zapier.